- I have been interviewing the musicians who have participated in Asian Meeting Festival (AMF) but you are the first one who is not from an Asian country. Can you tell me why you were invited? Yes, when I received the invitation I was surprised because I am not Asian. However, I have been to Japan many times, because I like it here and I've come back every year since I first came in 1993. I've already been here four times this year and will be back in December again, so I have a deep personal connection with Japan. Also my mother was born in India so I'm not completely unrelated to Asian, but still I was surprised. My background is in improvisation and free jazz, and I try to listen to everything from noise, ambient, rock, and free jazz. I try to make new things from being inspired or combining different elements, and also try to always challenge myself. - Do you visit other Asian countries as well? I would really like to, but the reality is that I haven't been to many places. I have played in Thailand, Indonesia, Hong Kong, but compared to Japan it is very little. - What would you say are your interests in Asia? Is it to play music to a new audience or is it to connect with people who are making music in each of these regions? Let me just talk about my relationship to Japan. Since I was young I was always interested in experimental music. This was in the 90's. I would go search for these records or mail order from Osaka, and this made me really want to go to Japan. When I first came, I just wanted to put myself in that environment so I had no plan. Eventually, I started to have opportunities to collaborate with musicians that I was listening to. There are two things that I really enjoy - one is to buy records and the other is to eat well (laugh). Japan does both of these very well so I've been returning every year. Australia is relatively close to Asia, so there are many people who immigrate. Especially there are many Thai, Vietnamese, and Chinese and they have their community so it is very east to get ethnic food. I have been eating this kind of food since I was little and it doesn't feel foreign to me. Many Australians become informed when they travel through Asian, and I am the same. According to my mother, I was interested in music before I started talking. Apparently when I was still a baby, I would imitate the music playing in the super market when my mother took me. In that sense, my mother was wonderful because she would buy 7 inch records. Since I was little I started to collect records such as The Beatles, Led Zeppelin, Paul McCartney. - You mentioned that your mother was born in India. Did you listen to Indian music at all? I was in an environment where my house was filled with music, and we had a lot of ethic music, especially Middle Eastern music. The good thing about my childhood was that I was very open-minded. For example when I listened to The Beatle's "White Album", even if I heard a song that was Musique concrète, I didn't know what was experimental and what was not, so it came in as the same as all the other songs. I think this is a very good thing. My grandfather owned a junkshop that sold used instruments and records. He always told me that I could take anything from the shop, so I visited frequently. When I was seven, I found a record with an apple on it and thought: "Is this The Beatles?" But when I brought it home is turned out to be Yoko Ono (laugh). These kinds of things led to me becoming familiar with many different genres of music. The shop also had junk effect pedals and open reel tape players and I became familiar with these kinds of machines too. When I was a child I really wanted to play the drums. I started to play the drums when I was around 10 or 11, but my parents wanted me to play the piano. I really didn't want to, so I learned for about a year to please them, and afterwards I only played the drums. Soon after this there were many coincidences that connected with each other. One time I found an Iron Maiden record and thought, "This looks amazing!" but when I brought it home the inside was "Live Evil" by Mile Davis (laugh). But I got really hooked on jazz after that. That was when I was 13. From there on, drums and rock became old and I pursued my interests in jazz. My first concert was when I was17 and I was a free jazz drummer. I was familiar with electronic devices, thanks to my grandfather's shop, and I used effects and contact microphones with my free jazz drumming and started to incorporate tape loops and other machines into my performances. After graduating high school I moved to New York. I didn't have a specific plan, but when I found out that all the music that I was listening to was coming from New York, I felt strongly that I wanted to experiences it directly. I was in New York cutting down on food expenses to buy records and going to concerts. When I ran out of money I would return to Australia and work to save enough to return to New York. I repeated this for about 4-5 years. At the time, I was listening to a lot of wonderful "proper" music as well. For example, Miles Davis, Cecil Taylor, Mark Ribot, John Zorn, Fred Frith and so on. But then one time I saw a performance by Keiji Haino. This was a really shocking experience for me and made me rethink about music from scratch. I decided to start playing the guitar. I had never played the guitar and didn't really know how to but I was familiar with effects and electronics by using them with my drum playing rock and free jazz, so I started by applying them to the guitar. I had no idea on how to actually play the guitar. - So you learned to play the guitar on your own? Yes, self-taught. When I returned to Australia and said I was going to do a concert with a guitar everyone was like "what's wrong with you?" In New York, a person introduced me to John Zorn. He seemed to like me, although it was hardly a year since I started playing the guitar, and he asked me to play with him. 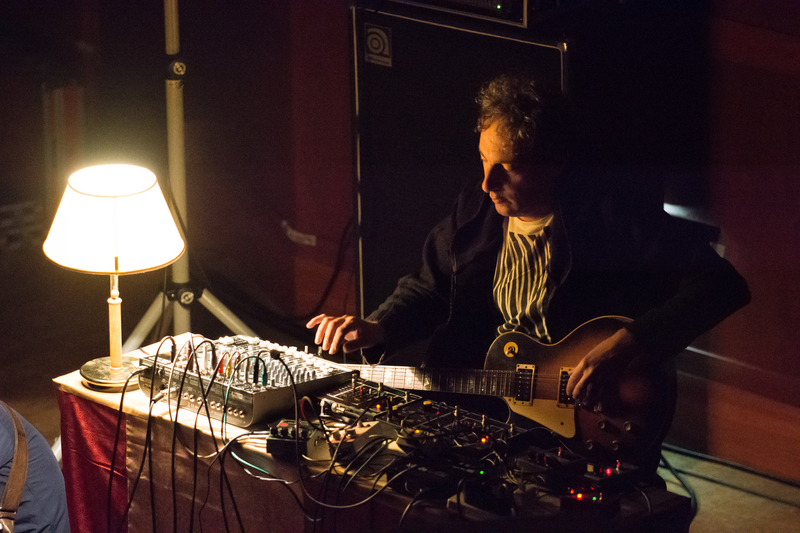 There I had a chance to play with wonderful players like Fred Frith and Arto Lindsay. I learned a lot from John and am very grateful to him. Thanks to the gig in New York, I had a chance to go to Japan for the first time. It was after my show in New York and I made a stopover in Japan on my way back to Australia. I think it was 1993. There I had a chance to play with Merzbow and Masonna. - AMF was started by Otomo Yoshihide in 2005, but had you ever seen any AMF concerts before? I had never been to an AMF concert, but funny enough I witnessed Otomo's first live show in the U.S. I think it was a Zorn concert and Pain Killer was playing, but as a special guest not listed on the bill Green Zone (Otomo Yoshihide / turntables and guitar, Hideki Kato / bass, Masahiro Uemura / drums) played, and I remember thinking "what a cool group!" I needed a bass for my band that night, so I asked Kato to join and we had a good exchange. In Australia, Otomo came to play with Tony Buck in a band called Peril and in Europe I saw him touring with Keith Row, so I've had many exchanges with Otomo. In 2000, or maybe a bit earlier, I invited Otomo and Sachiko M to a music festival that I was organizing. I hadn't seen Otomo recently but I have been following what he has been up to. - You have an ongoing improvisational project with Jim O'Rourke and Keiji Haino, and you also organize festivals. When Otomo started AMF, he was observing how freely the European free improvisation scene could communicate across borders but in Asia each country is isolated and he wanted to change this situation. What do you think of this? I understand how Otomo feels. When I was organizing festival in Australia, I would invite international guests and also try to create a space where they can play together with local musicians. I think younger musicians can learn a lot from international musicians and more experienced musicians, and we learn from people coming from different countries, so I think this kind of exchange and networking is very important. I was able to make records and tour with European musician that I connected with, so I understand very well Otomo's desire to build a scene like that in Asia. There is not much of this kind of activities in Asia, and for example one may think that there isn't a scene in Thailand or Vietnam, but that's actually not true, and there is a scene everywhere and it's important to try to connect these. - As someone who has been consciously involved in improvisation like you, do you think it is an effective way to facilitate exchange? I think it is very effective. Improvisation itself is like an exchange, where everyone is equal and it progresses without a hierarchy, like our conversation now. There is no rules or script, but someone says something and some may say that's interesting, some argue, and others may be quiet just saying one or two words - that is quite normal, isn't it? Improvisation or performances that we do are exactly the same. I think improvisation is very effective when you are trying to encourage communication in a situation without a script. However there are good sides and bad sides to this. For example when you have someone with a strong character like Haino, often the whole performance will be colored with his style. Of course this may not be the case all the time. So I think even with its challenges, to exchange freely without being restricted to one idea, one aesthetic, one method, or one philosophy is very effective. - AMF seems to have ambitions to expand their reach outside of Asia and to other regions including Europe. It feels as though including you from Australia is their first steps into this new direction. Do you think there are possibilities for festivals in Australia to collaborate and have exchanges with AMF? I think that is very possible. In Australia now there are many concerts for experimental music. There are also many artists visiting from abroad to play and it is very active, so I think we can easily imagine this happen. - I would like to ask a more abstract question at the end. There has been many attempts to try to combine music from Asia and Western music but very few are successful. It seems to me that many are satisfied to fit Asian music into a Western musical system, and therefore for a long time the relationship seems like one where Asian music is being used for Western music. However, it feels like now that Western music is asked to change. It is exactly how you describe it - till now Western music has only used the surface of Asian music in a very shallow way. Ethnic elements were used very lightly to give an exotic feel. I think this has to change and I would like to see it change. This is applies not only to music but also to all genres of art, where a way of thinking and a framework is set by white elitists as a standard. - If Western music were to change, how do you think it would? What I am most attracted to in music is "sound." Personally I think there is no gender when we make music. I am interested in sound, and you can say that my music purses this interest. The reason why I like John Cage is because he dealt with sound itself. I was attracted to early Japanese noise because it felt different from the noise coming out of Europe and the U.S. It felt like the Japanese had a pure interest in sound. It wasn't about politics or about being macho but being immersed in sound, and I was interested in this. I don't know if this is something Asian or Japanese, but this is the reason why I came to Japan. Today, there are many scenes, but in general what we receive as information is very limited. For example there is a tendency to view scenes from the U.S. to be a standard in music. I disagree with this trend where we don't discuss about all the other things that happen in the world. I have had conversations with people making experimental music in the U.S. and have discussed what they are dealing with, and I feel it is different from what I am thinking on a daily basis.